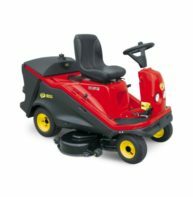 The Gianni Ferrari GSM is a commercial ride-on mower that combines high range technical features and specifications, with a maximum width of only 85 cm. 16HP Briggs & Stratton Vanguard, twin cylinder air cooled commercial grade engine, with pressure lubrication & oil filtration, engine cooling air drawn from clean air zone to prolong engine life and minimise cleaning equipment. Heavy duty construction and commercial grade components throughout allow-trouble free long-life commercial operation. Rear storage areas and tow hitch included.